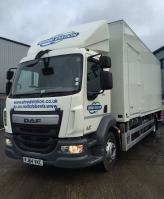 Following further business growth in 2015 we are increasing our shredding vehicle fleet once again. 5 new trucks will be added to our current fleet including two high security mobile shredding trucks capable of destroying over 2500 kilograms an hour to the European Standard EN15713, one 12 tonne collection and two 7 ½ tonne collection vehicles. Our fleet recently became accredited under the Fleet Operator Recognition Scheme (FORS). You can read more about this accreditation in this article on FORS. While increasing fleet operations we ensure that all vehicles meet European emission standards. We take caring for the environment very seriously and one of our plants is currently operating as a carbon neutral facility. You may wish to read further with our article on the benefits of using a shredding company with a large mobile shredding fleet.